About Fate testarossa's height? 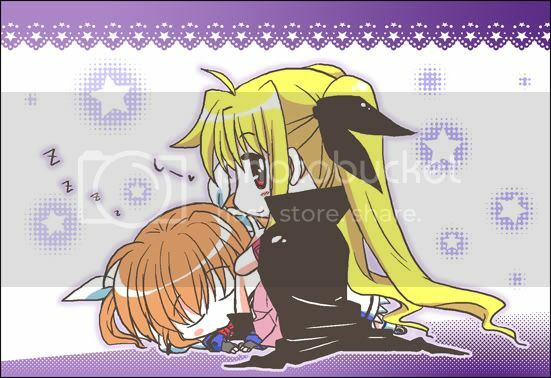 (nanoha Strikers?)? <- Is a flat 160cm. Huh, I thought they were taller. Yes, those heights are not consistent with what we see in the show or in Vivid, they're just an estimation made from the original characters' design sheet, so not necessarily everything from the original concepts made its way to the series in the exact same way, and not necessarily the estimations were precisely made. I'm not sure what "official measure" Alter uses to make their scale figures, but measuring Fate in Shin Sonic form (scale 1/7) and doing the conversion, it would turn to a 171.5 cm Fate which is more or less the height I picture her, since she is one of the tallest female characters. That would make Nanoha 1.62-1.65ish in a rough estimate and Hayate 1.55 because I don't have either figure to measure them. That's just a way it ocurred to me of figuring her height. Do they make a Signum? She is, I think, the only woman taller than Fate in the cast, and I wonder how tall that would make her. 175cm or thereabouts? O_O I thought that Fate was 1.70, Nanoha around 1.65 and Signum way taller than Fate. 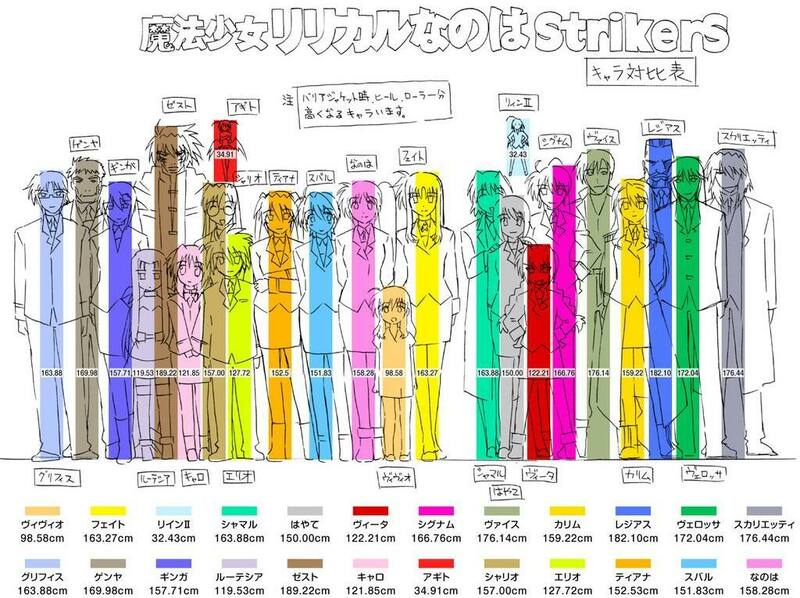 It's not official information, as I said in my previous post the height data were estimations made by a fan from the original sketches of the StrikerS data book (I think it was called that). Not everything from the original concepts of StrikerS made its way to the animated series, so I think Rogue Devlin estimations seem more accurate. I'll try to update when I get Nanoha and Signum from the same Alter figure releases, because although there are a lot of reviews of the figures online, the measures they have are of the figure's whole length and not only the body itself. I would still like to know what reference they use to justify their "scale", but there doesn't seem to be any available information online. so basically what would be the most accurate measurement of height for Strikers characters? Unless there are some StrikerS artbooks with the measurements out there I do not know there are no official numbers. Official site keeps silent, the series itself does not mention it as far as I remember and the official guides I have seen do not mention it either. I have seen a chart with the heights of all the MGLN characters,but just my luck I can't seem to google it or search it out. I'll post when I know. Fate is 163.27cm...although I think some fan might have made it up. I think so too. But seems like i'm taller than most of the girl characters in MSLN. I'm 1cm taller than Signum :)). But still, i don't believe that pic much. No. Uh... There is a way for artists to convert the drawings into height. Let's see, there's a type of conversion that I don't remember. You have to consider that these heights are based on Japanese conceptions. 170 cm is VERY TALL for Japanese girls (see Lovely complex, where a 170cm tall girl is considered a giant). So 166 cm is quite tall as well and 163 cm is nowhere near small, it's quite normal, while smaller than 160 cm is slightly on the small side, but not extreme either. Being really small in Japan is around 140 cm (see the series Hiyokoi).